03/14/2011 1:34 PM - DES MOINES, IA. 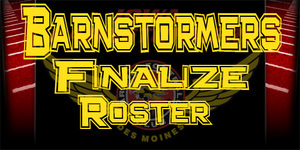 – Iowa Barnstormers Head Coach and Director of Football Operations John Gregory today announced the club’s 2011 roster. The roster consists of 24 players, including 9 returning players from last year’s squad. The Barnstormers kick-off the regular season this Saturday night when they travel east to take on the expansion Pittsburgh Power (0-1). Among the many new faces on the Barnstormers roster are Quarterbacks Brad Banks and Bryan Lee-Lauduski. Banks is a former University of Iowa standout, who was an All-American quarterback for the Hawkeyes. Lee-Lauduski joins the Barnstormers after starting for two seasons at Southern Oregon University. Both have impressed the coaching staff, leaving Gregory still unsure at this point who will be starter Saturday Night. Regardless of whom the starter is at Quarterback, Barnstormer fans will recognize some familiar targets as the team returns it’s highly talented receiving corps of former Iowa State star Todd Blythe, 2010 receiving leader Jesse Schmidt, Errick McCown and Tommy Ellingworth. Those four players combined for 64 receiving touchdowns in 2010. The receiving corps also includes newcomer Larry Beavers, who has NFL experience with both Carolina and New Orleans. The Barnstormers defense will be anchored by former Iowa State All-Big 12 team member Brent “Big Play” Curvey. This season, Curvey has been moved to Linebacker, which should give the Barnstormers pass rush a boost. In addition to Curvey, other standouts during camp have been DL DeMarcus Granger, LB Sam Smith and DB Patrick Stoudamire. Barnstormers’ President Jeff Lamberti said the team made a significant investment in Iowa’s scouting operation during the off-season, which led to the Barnstormers having a scouting presence at over a dozen National Football League training camps and cities last year. Many of the players on the 2011 final roster are a direct result of that effort. Iowa Barnstormers 2011 season tickets remain on sale beginning at only $117.00 per seat. The home opener at Wellmark Blue Cross Blue Shield Field at Wells Fargo Arena is scheduled for Friday, March 25 against the defending AFL Champion Spokane Shock. To place an order or for more information call the Barnstormers at (515) 633-2255 or log onto www.theiowabarnstormers.com. Click HERE for final roster!